This mounding perennial has lance-shaped gray-green leaves and tubular scarlet flowers in the summer. It is a brilliant addition to a hummingbird garden or as a border along a walkway due to profuse and colorful hot season blooms. 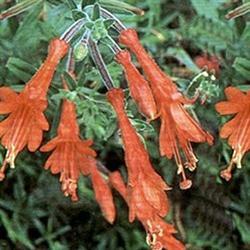 This plant has no equal for providing summer color and a nectar source during the hottest months. In very cold climates this fuchsia may die back in winter but will come back reliably the next spring. It is best pruned back hard in late fall. Epilobium californicum will stay below 1' high and spread 3 to 4 feet. Planted from a one gallon container a year ago this plant has turned into a show stopper in our front yard. It produced just a few blooms last year so we did not know what to expect from it. I think it appreciated our drought-ending rainy season and has only been watered 2-3 times since last spring. It reached it's mature size quickly and as described the hummingbirds and butterflies love it. FYI we are in coastal SF Bay area.